With 14 spacious cabins, tastefully furnished, its topside bar, a gourmet restaurant and a relaxed sundeck in fresh air, not to mention extraordinary levels of service. 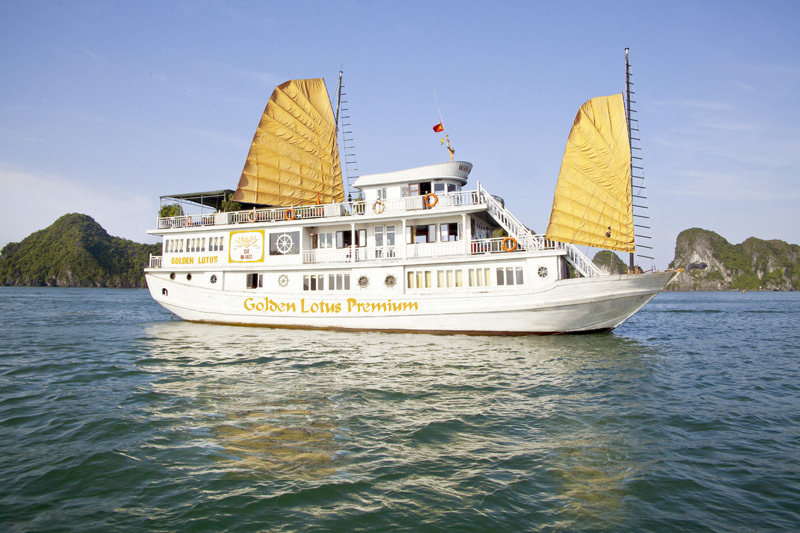 Golden Lotus Cruises offers service with style. 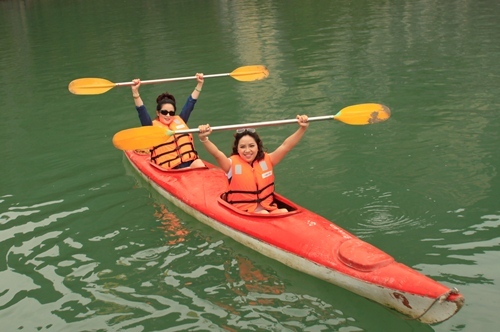 You can enjoy active pursuits such as swimming, snorkeling, fishing and kayaking in the crystal clear blue waters. We also run cookery demonstrations for those interested in learning the art of Vietnamese cooking. 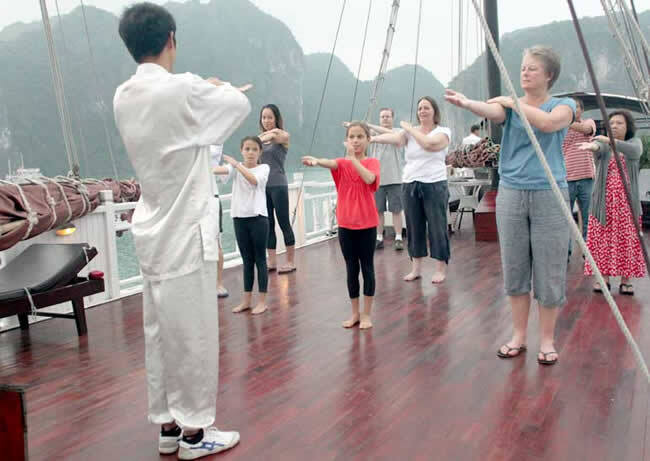 It’s up to you: you can make your cruise as busy or as lazy as you like. With 14 spacious cabins (01 Family connecting room, 02 Ocean View rooms and 11 deluxe rooms), tastefully furnished, its topside bar, a gourmet restaurant and a relaxed sundeck in fresh air, not to mention extraordinary levels of service. 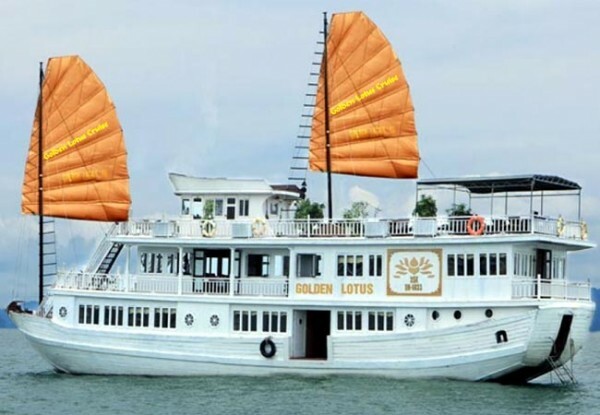 Golden Lotus Cruises offers service with style. 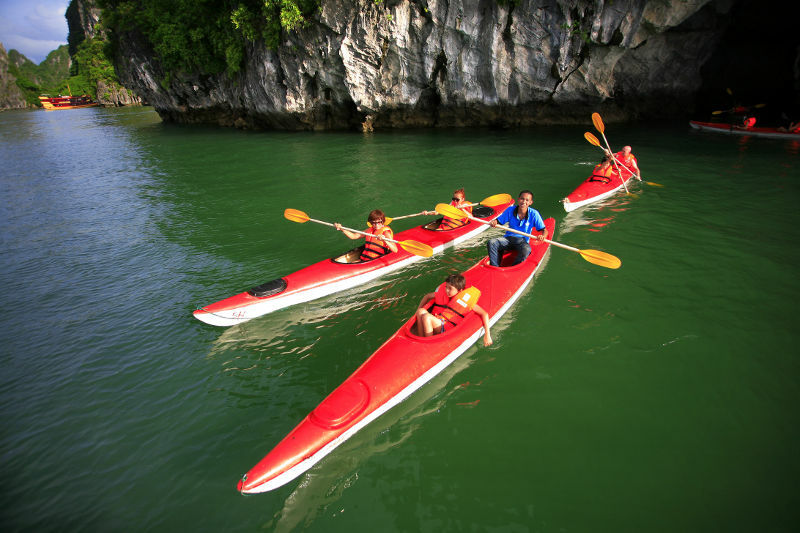 You can enjoy active pursuits such as swimming, snorkeling, fishing and kayaking in the crystal clear blue waters. We also run cookery demonstrations for those interested in learning the art of Vietnamese cooking. It’s up to you: you can make your cruise as busy or as lazy as you like. Size: 40 metres in length, 10 metres width. Number of rooms: 14 A/C rooms. 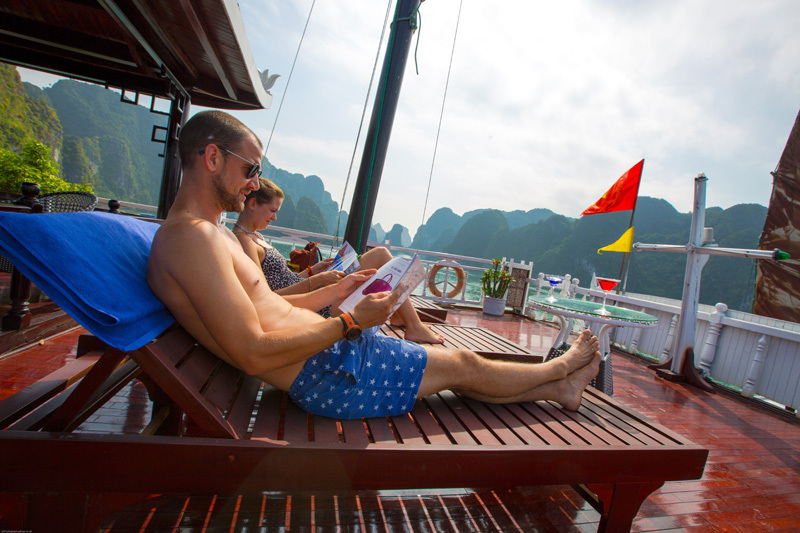 On top deck with sun – bathing chairs with 28 metres in length, 7 metres width. Friendly & helpful & professional crew. 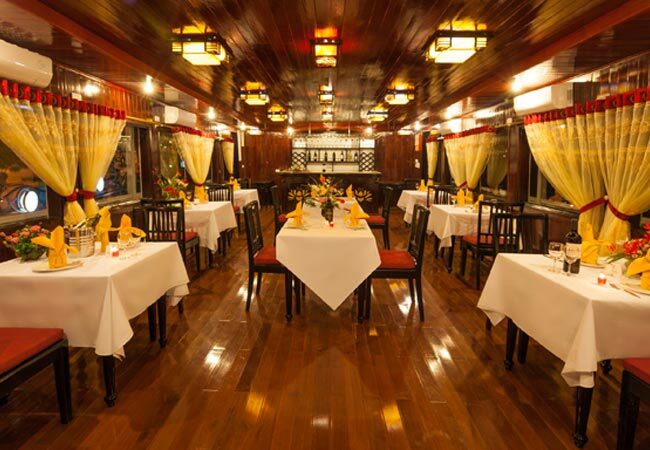 The dining room is designed in oriental style bringing you a cozy, intimate and romantic atmosphere with the wonderful scenic backdrop of the soaring limestone cliffs. The dining room is also the major entertainment area, allowing you either your individual moments or to share laughter and games with others. 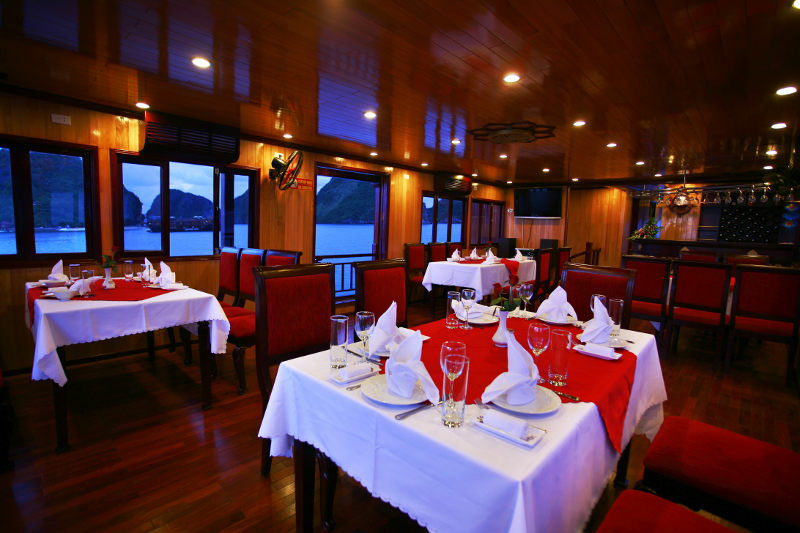 The topside bar of Golden Lotus Cruises offers you pleasant, relaxing music, fresh air and an impressive variety of cocktails. A delightful place to socialize and watch the sun slip into the Bay. 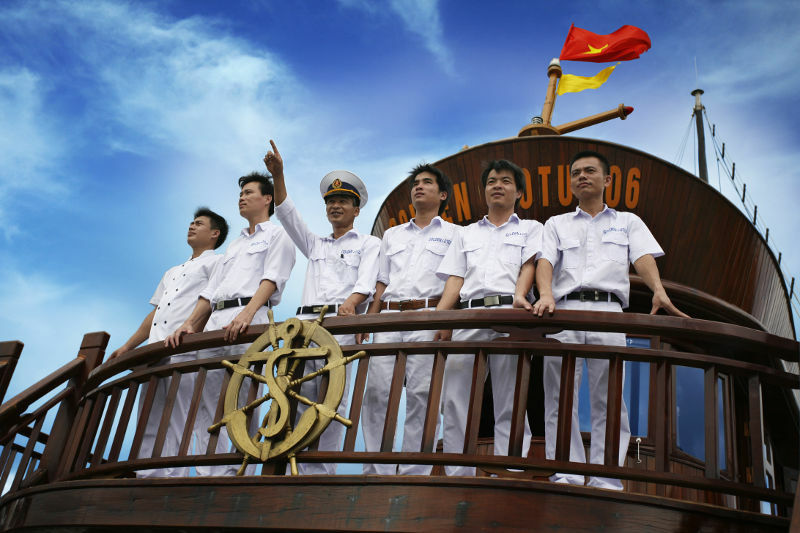 10.00 – 10.30: Have a short break in Hai Duong City..
11.45: Arrive at Bai Chay, Halong Tourism Harbor. 23.00: End of program. Night in Halong bay. - Vehicle (A/C): Ford transit 16 seats – or County 29 seats. - All meals (standard and hygienic meal). 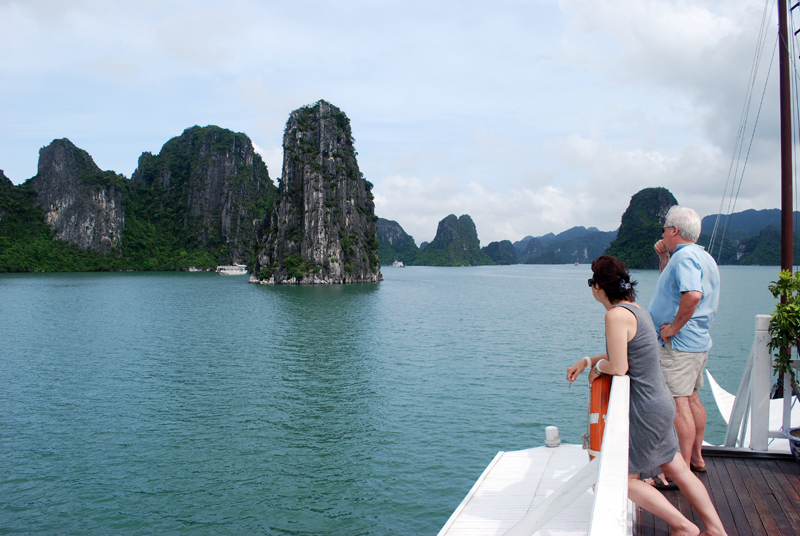 Day 1: Ha Noi – Ha Long (Lunch+ Dinner) 8.00 – 8.30: Pick you up from hotel, departure to Halong Bay. 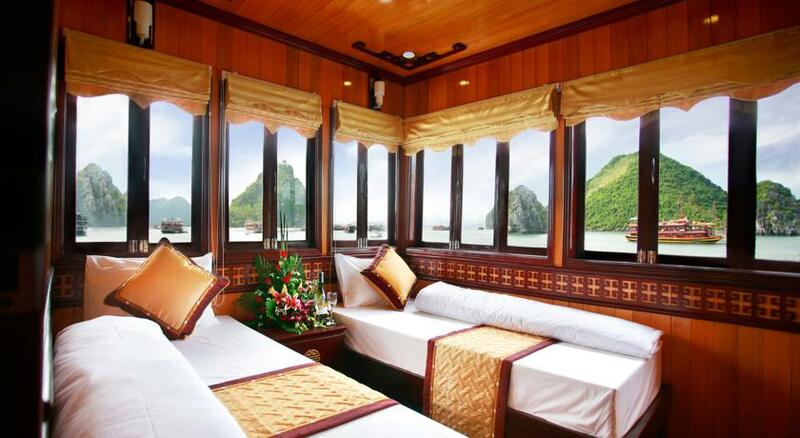 12.30:Start cruising to visit Halong bay, check in cabins. 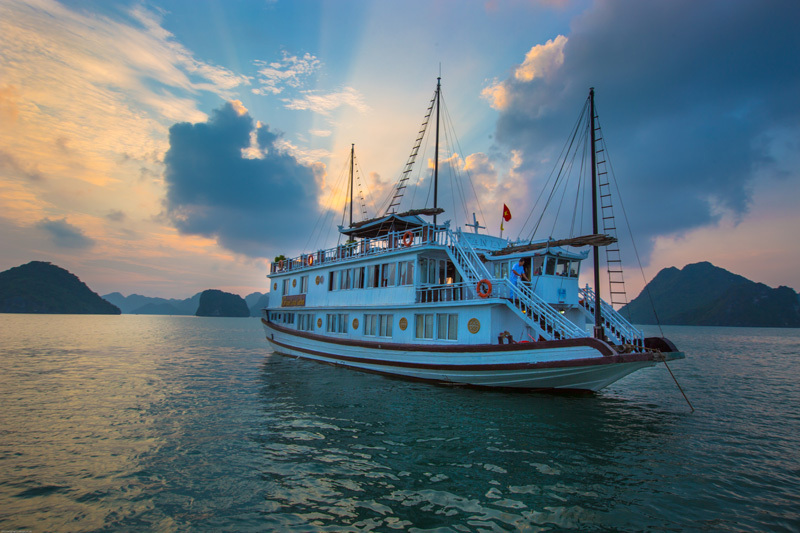 7.45 : Transfer to a small boat, cruise to the bay’s most untouched areas of Halong bay such as wild caves or mystical water tunnels.., much time for kayaking and swimming. . Lunch is served on boat. 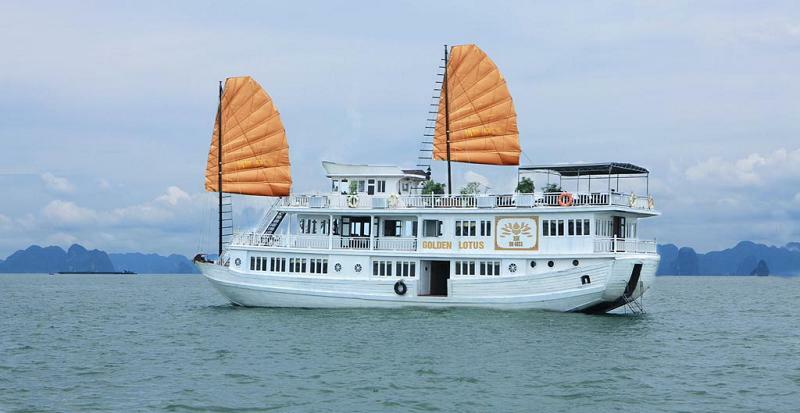 16.00: Come back to Golden Lotus Cruise , spending the second night. 19.30: Have dinner and overnight on boat. 12.15: Car pick you up, back to Hanoi. 7.30 : Having breakfast on boat. 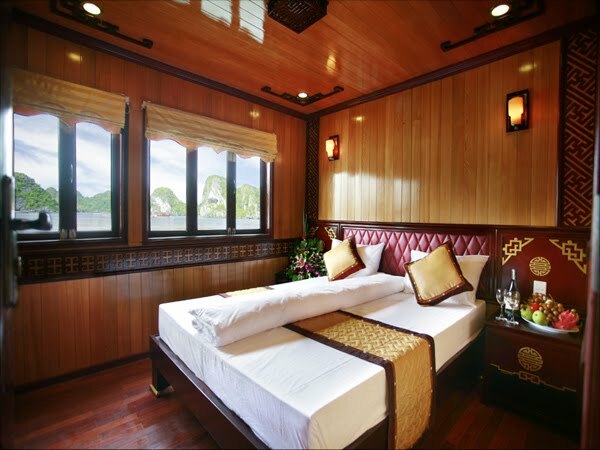 7.45 – 8.00: Transfer to another boat to go to Catba islands, trekking on Catba national park or go biking along the beautiful forest roads. 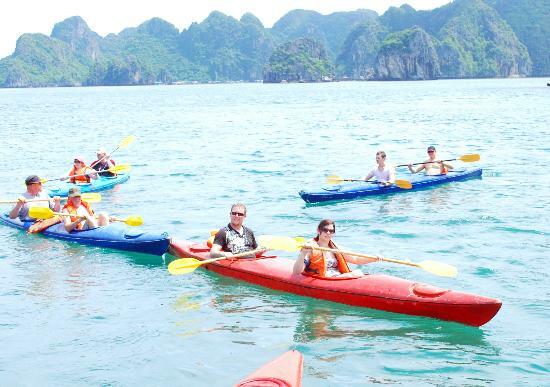 In the afternoon: Kayaking around Lan Ha bay, much time for swimming on beach, and visit monkey island. After that check in at hotel in Cat Ba Island. 19.00: Have dinner at hotel and free time explore Catba town by yourself. 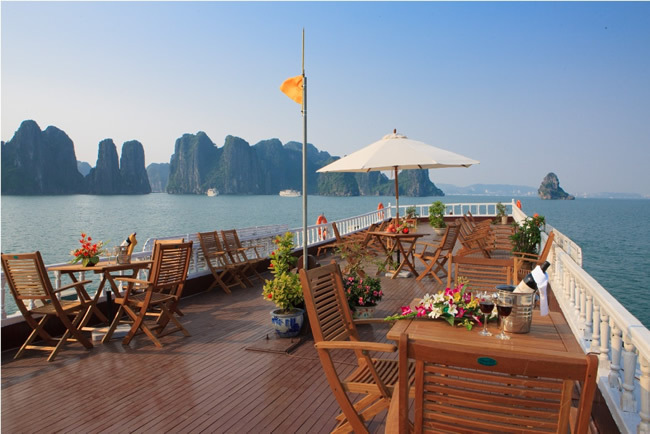 After breakfast, get back to the boat by bus and cruise back to Ha Long City. 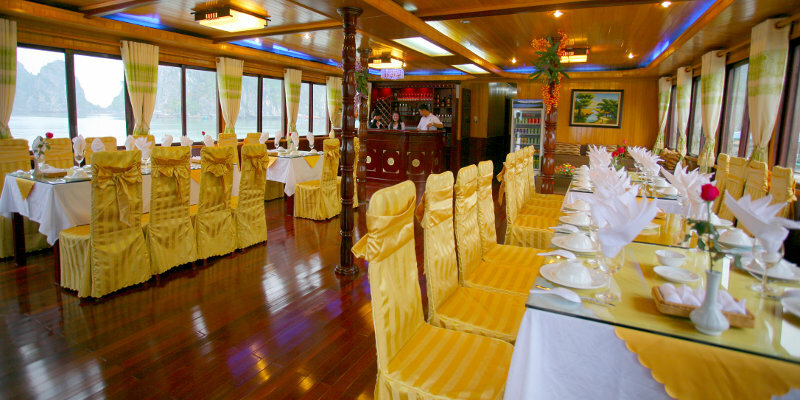 Arrive in Ha Long City at 11.30, have lunch in restaurant. After lunch, take a bus back to Ha Noi, at 16.00 PM, finish the tour.